There is a road that begs to be travelled by the visitor to the Wilderness area. The Seven passes road, also known as The Old George – Knysna Road. 1. Check in at www.facebook.com/wildinfo - and like us while you there! 2. Make sure your camera battery is charged and you have free memory space. 3. Make sure you have some water or cold drinks for the trip. 4. Adhere to the road rules and look out for cyclists and pedestrians. 5. Do NOT drink and drive. In 1867 master pass builder, Thomas Bain was commissioned to construct a road between George and Knysna. He started on the Knysna end, and his brother-in-law, Adam De Smidt started on the George side. The road which crosses 10 rivers, and seven gorges, is approximately 75km in distance, and served as the main route between George and Knysna for 70 years until the N2 was opened in 1952. While planning the route, Bain and De Smidt argued heavily on the routing. This resulted in the two of them not speaking a word to each other ever again. Although called the Seven Passes Road, due to the fact that some sources do not recognize the Black River Pass, and others do not recognize the Silver River Pass, the route takes you through eight passes. 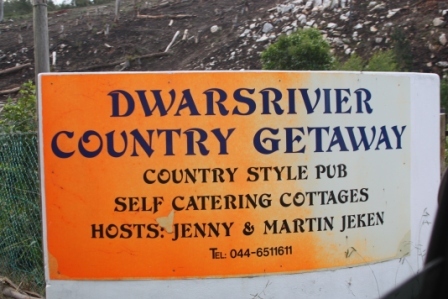 Leaving George, the Black River Pass (Zwartrivierhoogtepas) takes you past the Garden Route Dam, over the Swart River and onto the hilltop at Saasveld. This pass is suitable for most vehicles and is tarred, but has no shoulder. It is also a popular road for cyclists. The Kaaimansgat Pass took its toll on ox wagons in the 1800’s, having to cross the Kaaimans River by means of a steep and deep gorge. The wooden bridge over the river was opened to the public in 1869, and was later replaced by a concrete bridge in 1904 on the same columns that was built by Adam De Smidt. The bridge, that carries the coat of arms of King Edward, was declared a national monument in the 70’s and provides great photo opportunities. Adam De Smidt did such a great job building the Silver River Pass, and almost no reconstruction has been needed to date. This pass takes you over the Silver River over a bridge that resembles an old English stone bridge. You will want to take a picture of this bridge. Keep an eye open for baboons and buck that roam this area. Flooding of the Touw River caused the demise of the original wooden bridge and the bridge was replaced by a steel structure in the 1900’s. This bridge is upstream from an island in the Touw River where water rushes down in a foamy frenzy after heavy rains. The Touw River Pass is an easy drive as far as bends and gradients are concerned. The lack of beauty of the bridge is counteracted by the beauty of the river below with ample rock pools, and the opportunity to park your vehicle and take a walk down to the river to enjoy the birdlife in the luscious forest. The rock pools also provide you with the opportunity to go for a swim in un-spoilt waters. Hoekwil marks the start of the Hoogekraal Pass, probably the challenging of the seven passes as far as construction was concerned. It however gives the traveler the opportunity to enjoy the natural beauty of the indigenous forest as described by Daleen Matthee in several of her books. 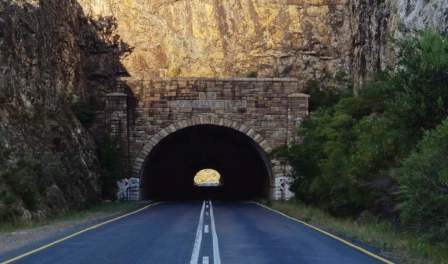 The Hoogekraal Pass ends near the town of Karatara. 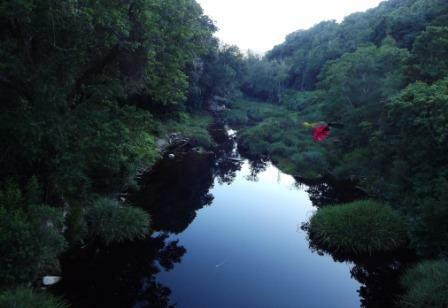 According to legend, the Knysna Elephant use to walk freely in these forests. Remember to allow yourself time to visit the Woodville Big Tree, where you can enjoy a half hour forest walk. Locals from the village of Karatara shows no signs of the hardship from the 1940’s after the government withdrew all the woodcutting permits from which the people of Karatara made a living. Travelling through Karatara, one get a sense of a forgotten village, where the only petrol pump is still hand operated. From Karatara the road takes you through The Karatara Pass amidst friendly smiles and waves from locals, and into the Homtini Pass. With the assistance of Charles Osborne, Thomas Bain completed the Homtini Pass in 1882. The Homtini Pass is very spectacular with sharp bends, including a proper hairpin, and is not suitable for heavy vehicles. The pass is often damaged by heavy rain, but offer breathtaking views. Keep a look out for wild animals, and occasionally a leopard can be seen. The final of the passes is the Phantom pass, named after the Phantom Moth which can be seen every spring. The Seven Passes road ends above the Knysna lagoon and joins up with the N2. There are some myths about the name of the Phantom Pass after an Italian heroin, Victoria Esposity, and her horse was killed by lightning at the summit of the pass while on route to try and get permission to transport prospective silk farmers on a ship back to England, after the silk industry did not materialize in the area. The silk farmers was brought to the area from Gouna, after the Wild Mulberry tree that grows in the area was thought to be the same as the actual Mulberry tree on which silk worms thrives. The worms were found not to eat the leaves of the Wild Mulberry, and the silk industry in the area turned out to be a still born idea. Seven passes in three days. 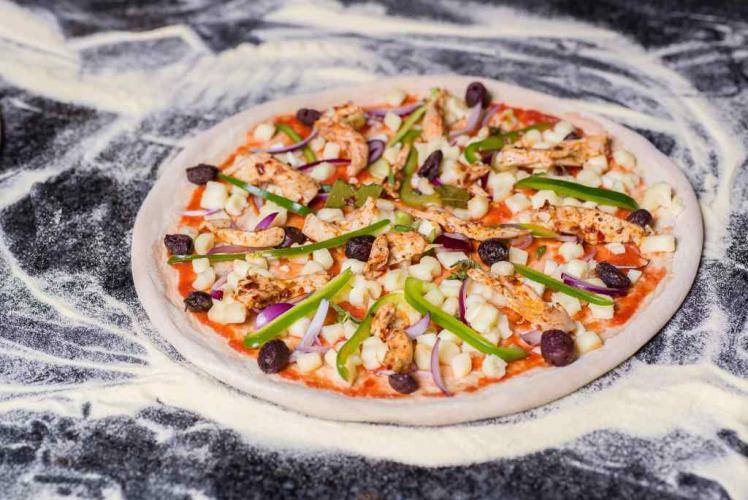 If you ever had the idea that a pizza is a pizza is a pizza, then you should visit Primi Piatti in George. "The Garden Route In The 60's"
Here is a video clip of a couple on holiday in The Garden Route in the early 1960's. WILD INFO | Your Guide to Travel, Tourism, Accommodation, Activities and Events in The Garden Route, South Africa. Disclaimer Notice: The content of this site is for information and demonstration purposes only. Details relating to any product or news listings is accurate and are provided hereby the website owner. Should you require any details on other available products or any additional information, please contact us. Site developed and maintained using the Ezi Pezi Website Builder & CMS system.